The girls and I love our pasta. Pasta in all shapes and sizes. Simple pasta with a Neopolitan tomato sauce. Filled pasta. Pasta with pesto. Or pasta with butter and freshly grated Parmigiano Reggiano. 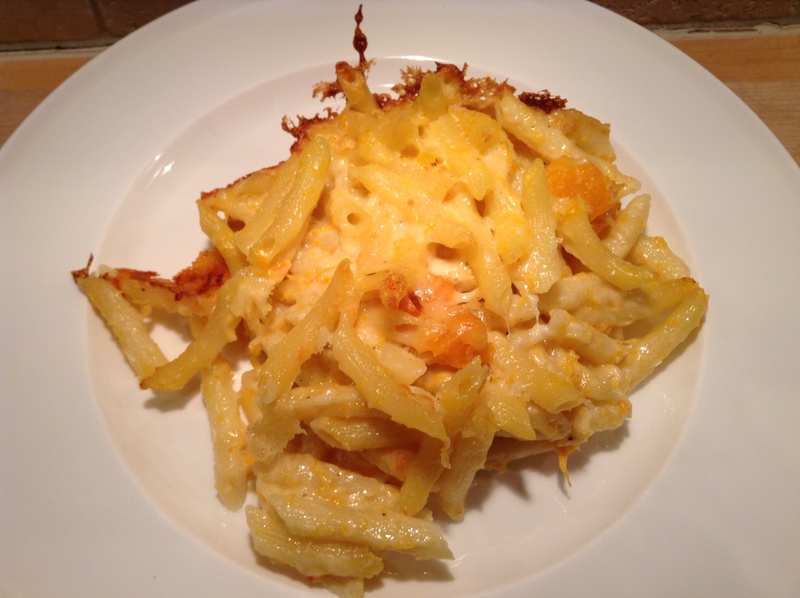 One of our favourites has got to be pasta al forno, or oven-baked pasta. 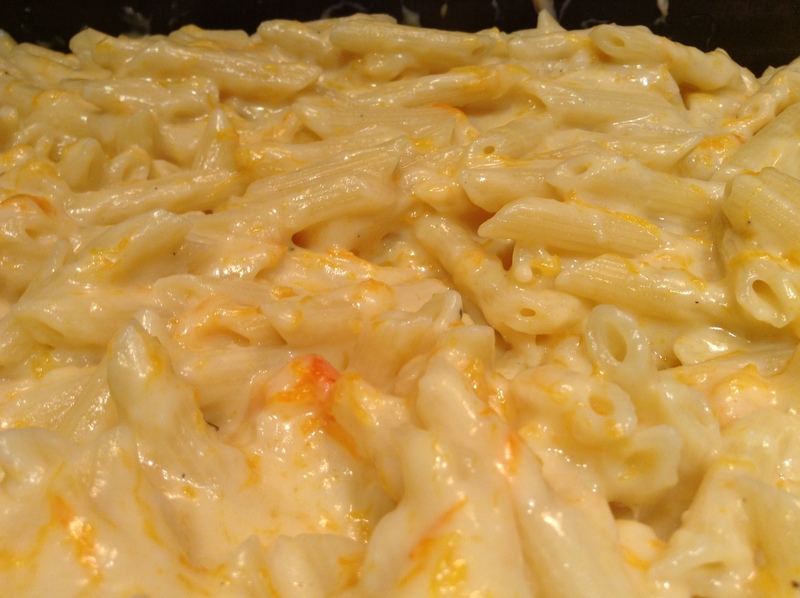 Cooked rigatoni or penne, tossed with a simple tomato sauce and fresh mozzarella, baked in the oven. I wanted to try something different with the baked pasta. 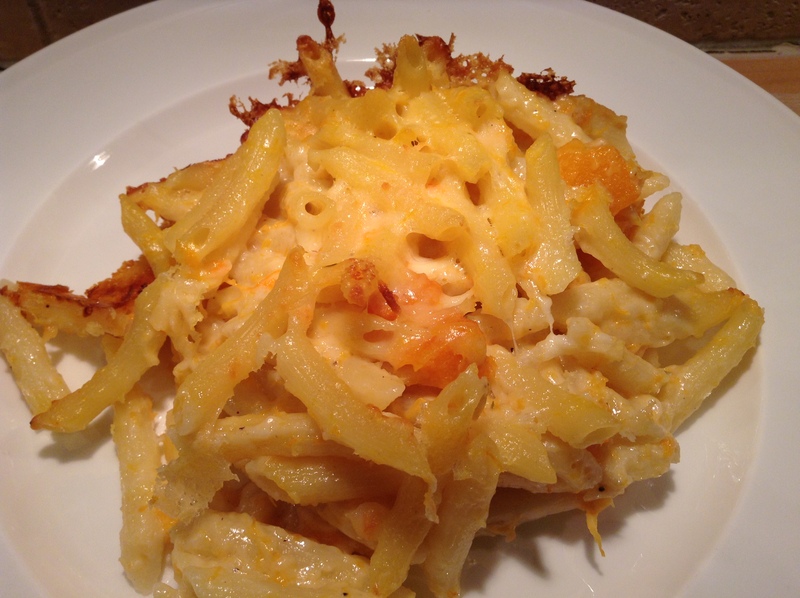 A play on mac & cheese, which I’m sure anyone with children knows all about. 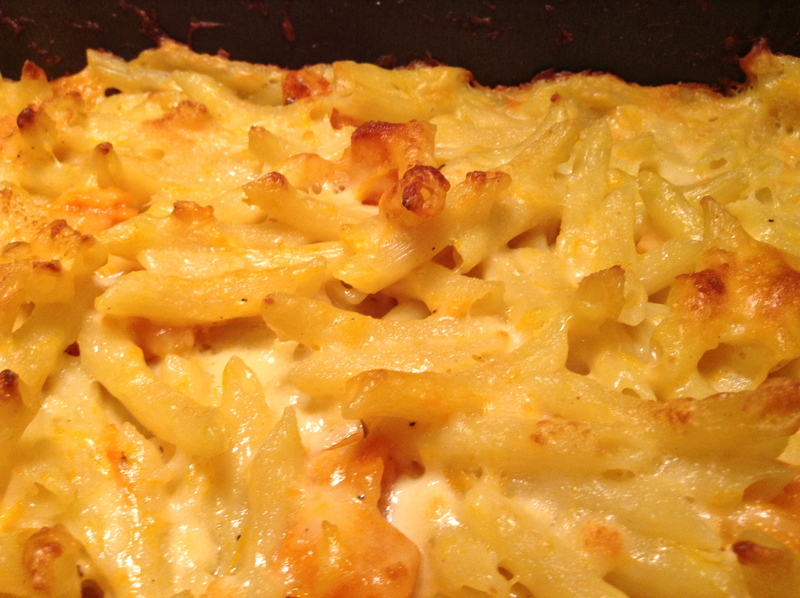 Something between mac & cheese and baked pasta. Only better. 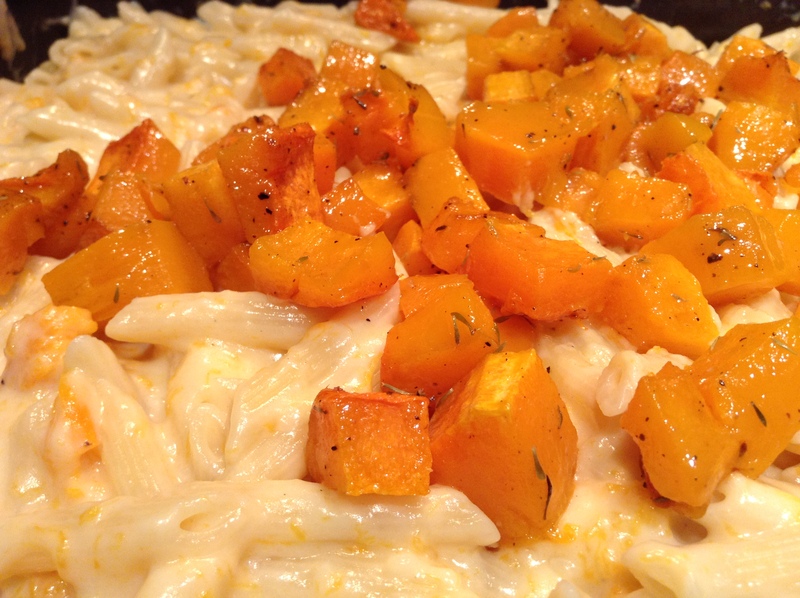 Penne with three Italian cheeses and the addition of roasted butternut squash. Oh yeah! 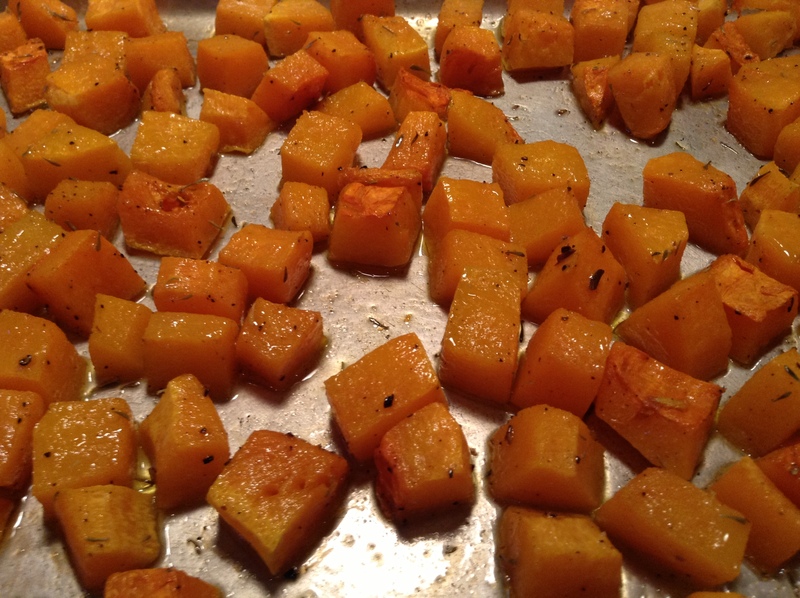 I began by chopping one whole butternut squash into bite-size pieces and threw it into a roasting pan. I doused it with some extra virgin olive oil, salt and pepper, a little thyme, and into the oven it went at 350 degrees F/180 C for about 45 minutes, or until tender. While the butternut squash was in the oven, I put some water to boil for the pasta. One package, 450 g, of your favourite pasta. Rigatoni works well, as do penne. 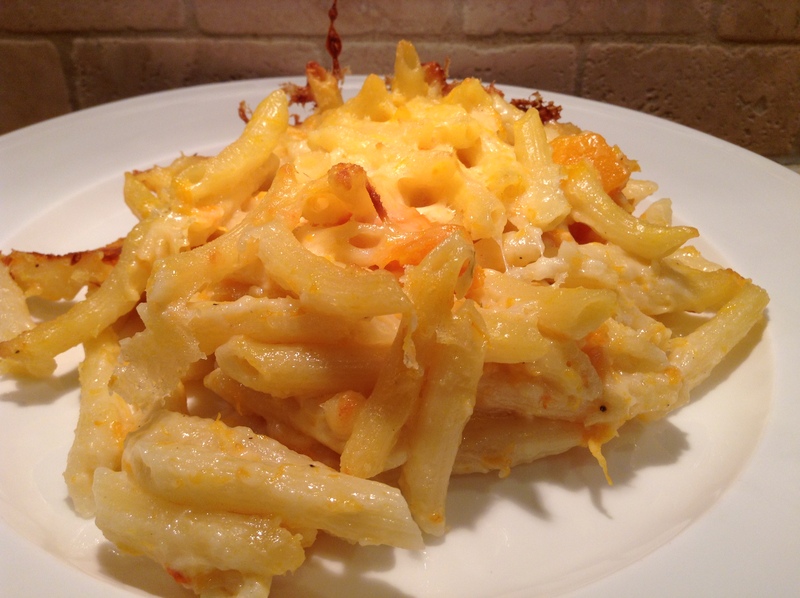 My personal favourite are pennette rigate, a smaller version of penne. 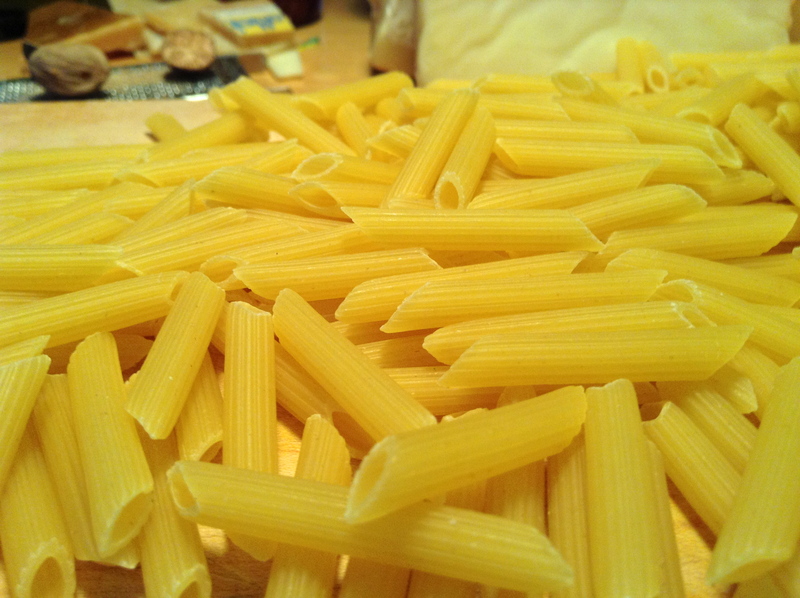 Rigate is the Italian word for ridges, which run along the pasta as seen on rigatoni and penne. The ridges help sauce adhere to the pasta instead of sliding off. It’s all about texture, really. As I waited for the water to come to a boil, I proceeded with grating the cheeses. You can use your own favourites here and it doesn’t have to be three varieties. One or two would work just as well. 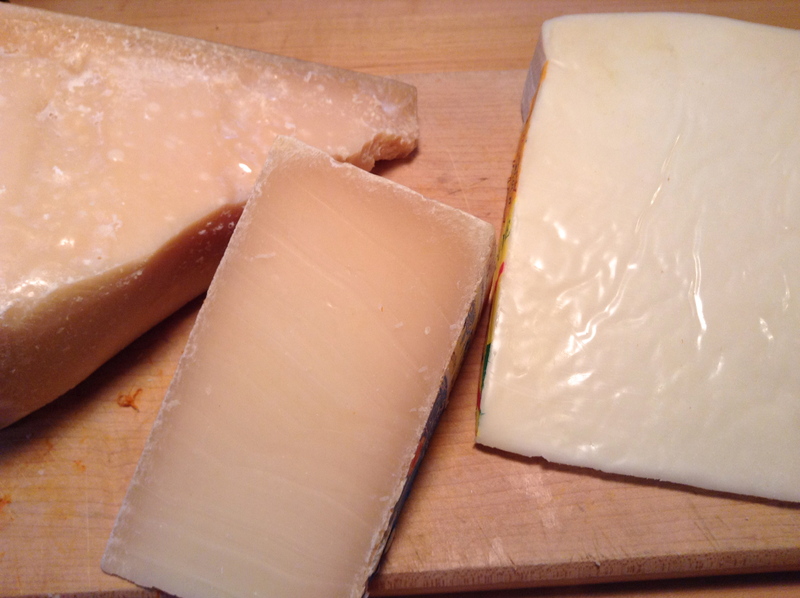 I chose Piave del Friuli, Asiago Pressato and Parmigiano Reggiano. 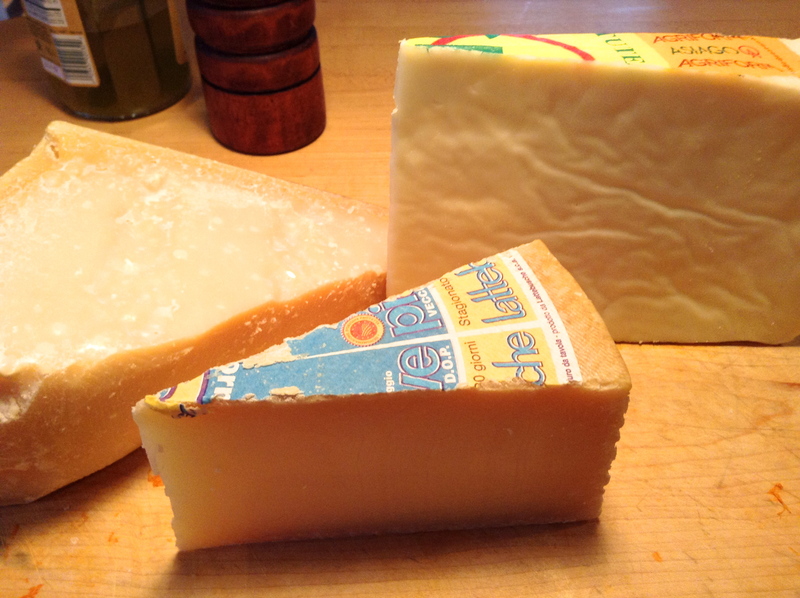 Piave del Friuli is a cow’s milk cheese made in Treviso, in the Veneto region of Italy. It is aged for about 16 months and its flavour is rich and creamy with a delicious nuttiness to it. Asiago Pressato is also made in the northern region of the Veneto, in a town called Asiago. Asiago Fresco or Pressato, fresh or young, is a semi-soft cow’s milk cheese aged for only 30 to 40 days, making it great for melting. It is buttery in texture and slightly sweet with a bit of a tanginess to it. This cheese would make a lovely grilled cheese sandwich. And of course, Parmigiano Reggiano which is a must with all pastas. Fontina from Valle d’Aosta would also be superb in this. I used about 150 g of each cheese for 1 package of pasta. At this point, the water came to a boil and in went the pasta. It’s important to cook the pasta al dente, perhaps even a minute or two just before al dente as it will go into the oven for about 30 minutes and cook a little more. 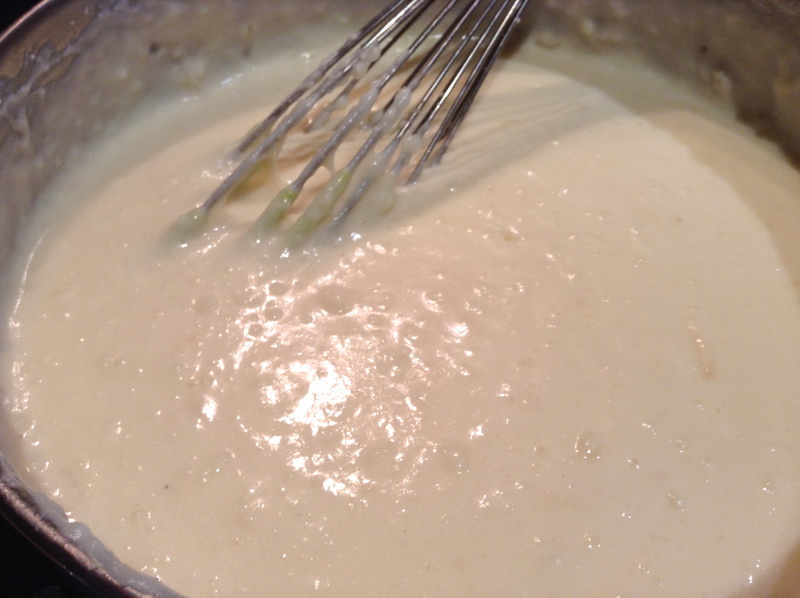 As the pasta was cooking, I began to make a besciamela, or béchamel sauce. Melt the butter in a medium saucepan. Whisk in the flour and cook for about 5 minutes, until golden brown. Gradually add the warm milk, whisking continuously as you pour. 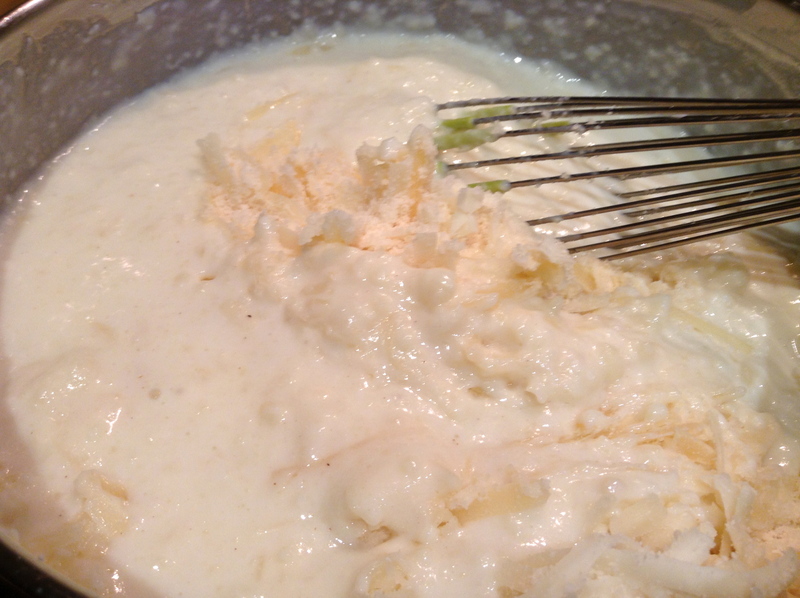 Over medium heat, whisk constantly until it is thick and smooth, about 10 minutes. Do not allow to boil. 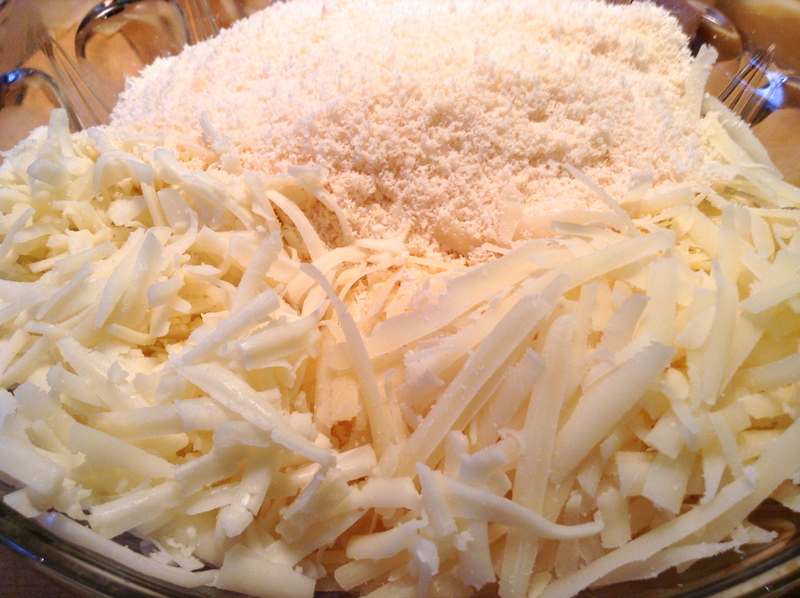 Remove from heat and stir in the salt, nutmeg if using, and the grated cheese. 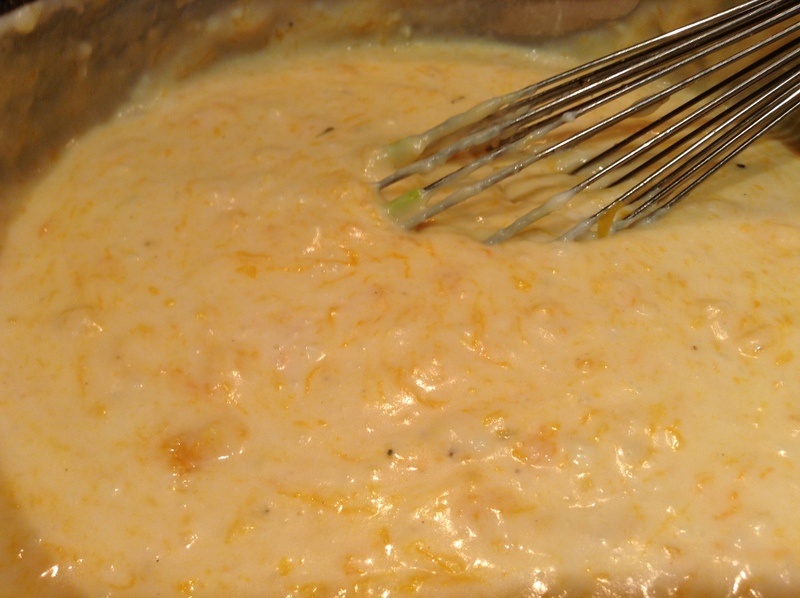 Stir until all the cheese has melted and is well blended. 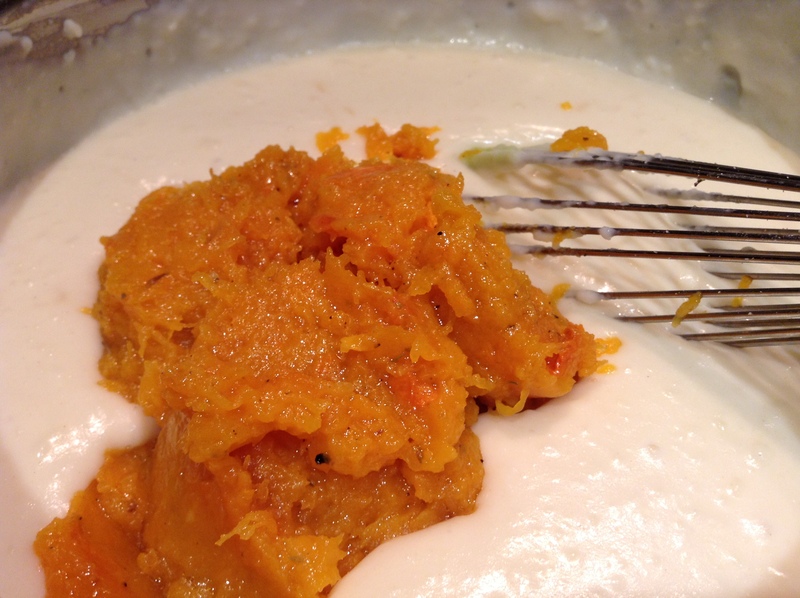 I thought I’d try mashing half of the roasted squash and adding it to the cheese sauce. Oh! It was so delicious! Cheesy with a slightly sweet taste to it. Might I make a suggestion here. If your little ones are picky, I would mash the whole thing up and throw it into the cheese sauce. They’ll never know it’s in there. Emma picked the squash chunks out of her pasta and then decided it was just perfect and quite to her liking. Next time, I’m mashing it all up! 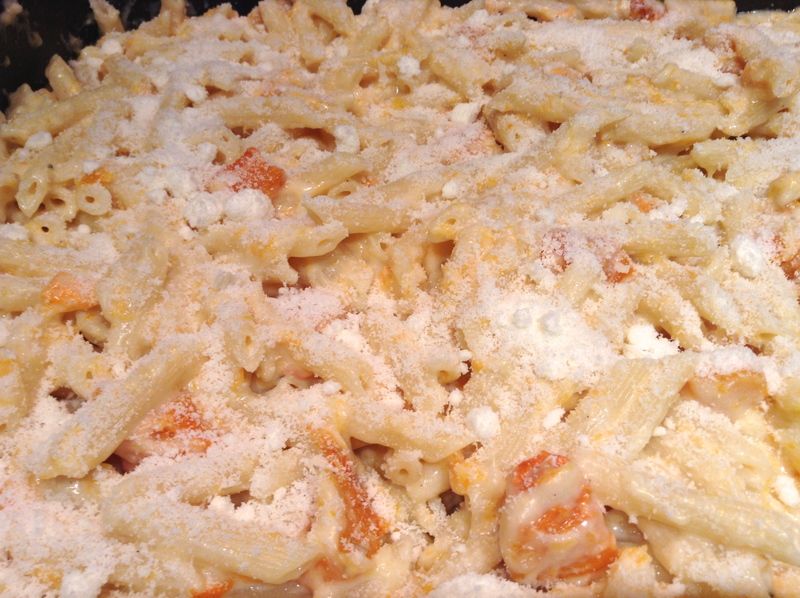 I poured the cooked penne into a large oven pan and then stirred in the chesese-squash sauce. 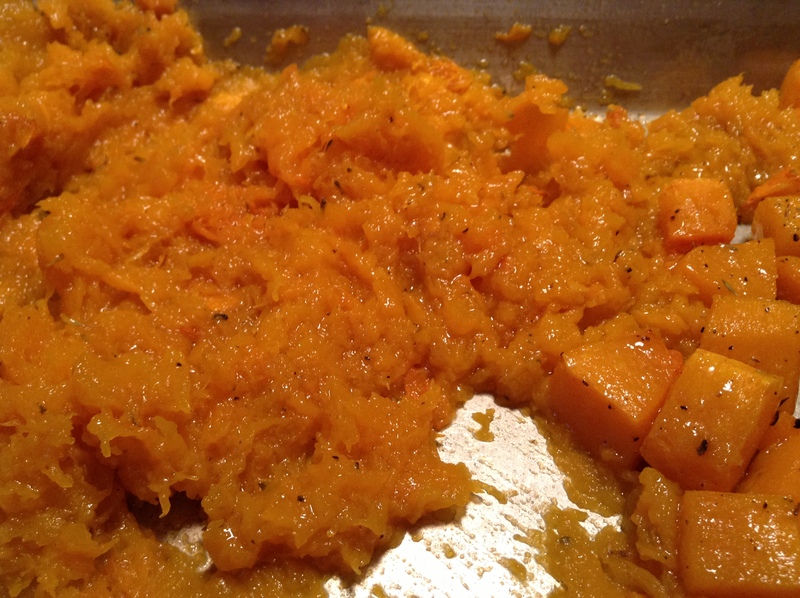 I added the remaining squash chunks and stirred gently. If you can manage not to have a small bowl of it before popping it into the oven, I commend you. Quite frankly, I would serve this up as it is, all creamy and yummy. But alas, I urged myself to add a handful of grated parmesan over the top and pop it into the oven, at 350 degrees F/180 C for about 35 minutes. It came out just as delicious! All baked and crunchy on the outside, soft and creamy on the inside. Just perfect! Or in Emma’s own words, as she sits by side feeling a little under the weather, “Be prepared for the goodness!”. As always with your posts and comments Lidia…I am drooling!!!! This is a good one to drool over! A chilled glass of white Chardonnay from the Veneto region of Italy! 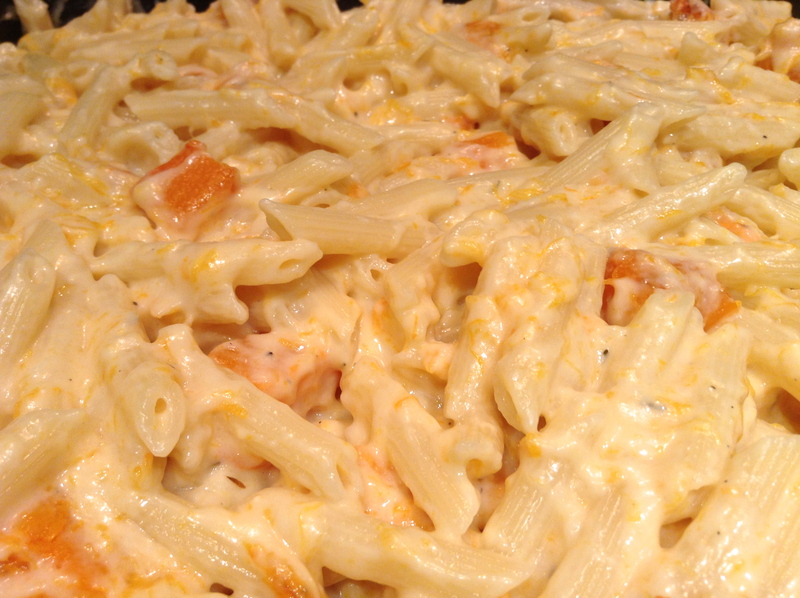 I’ve actually tasted this delicious dish… definitely one of my all-time, top three favourite pasta dishes. Not surprising, really, since it was created by Oh Lidia! 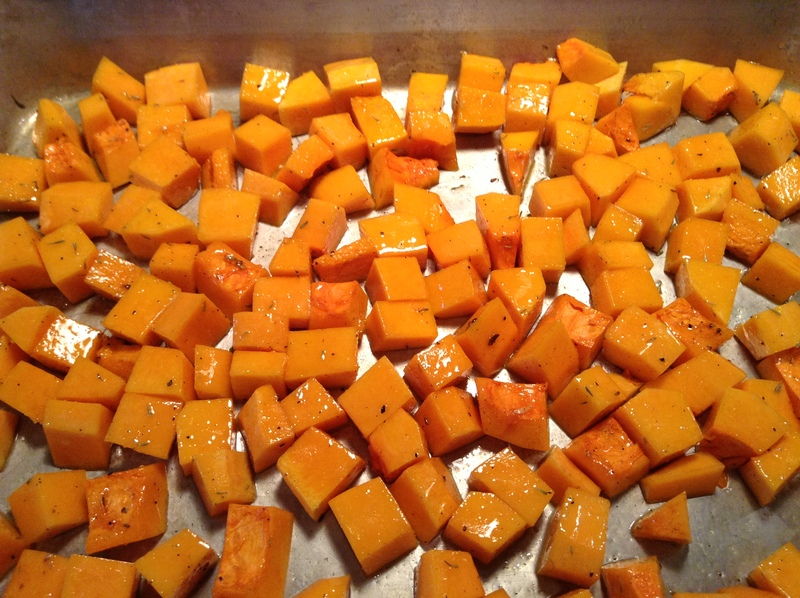 And I’m a sucker for butternut squash. 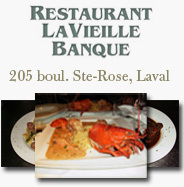 Coming from you, Ms. Oh Montreal, this is quite the compliment! Does this mean ohmontreal is back?! I can only begin to imagine how good this must be. Love the idea!!! Thank you! I must say, it really was delicious! Sounds like we would all get along quite well. Zia & I never met a dish of pasta we didn’t like. I cannot wait to show her this recipe. It’s not one that we make and I bet we’ll both love it. Thanks for sharing, Lidia. I’m definitely going to make this one. Yes, I’m sure we’d get along just fine! Would love to meet your Zia, she sounds wonderful! Lidia, this looks remarkable and I bet it made Emma feel much better after eating it. I know a bowl of this would conquer any under the weather discomfort I was having! I would have never thought to add nutmeg to my sauce! I will be trying this next time! Thank you Melissa! Nutmeg is that spice that you either love or hate, but it is pretty much a standard in a béchamel. And I bet you’d make a better and NICER neighbour than the current one! It could be arranged, you know… Or you could just come for a visit! Glad you’re back Teresa! Love that… off their trolley! I’m going to start using that. “Are you off your trolley?” “Oh, she’s off her trolley!” LOVE it! Emma always feels better after she eats! The great thing about pasta is you could keep it simple or make it fancy! 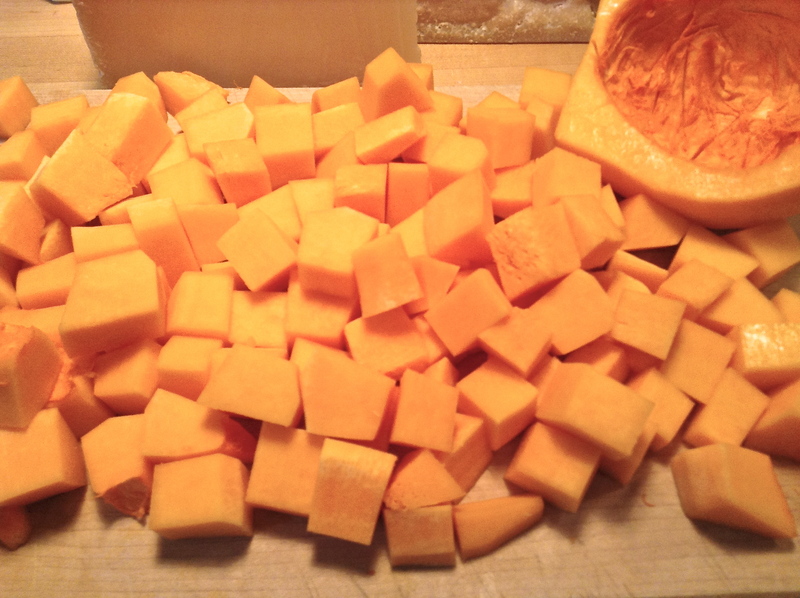 If you love butternut squash and cheese, you’ll love this! Yeah, I know what you mean! Thank you Erika! It was quite yummy, and the fact that my daughters loved it, that’s a plus in my book! That is one hell of a meal. It looks so delicious. Thanks so much for sharing… I have bookmarked it. I have already bookmarked so many foods from here, goodness me, am I going to cook the whole blog? Have a lovely week! Hahaha… I agree Liz. And it really is delicious! And the best part, my girls love it!! You are too cute! I know what you mean… I’m always adding recipes on my “to do” list and now it’s out of control!! !